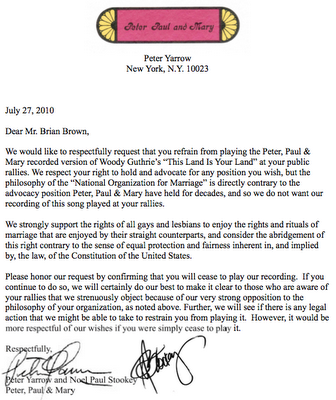 The numbskulls at NOM apparently have no clue why it’s inappropriate to use Peter, Paul & Mary’s version of “This Land Is Your Land” at their hate-a-palooza. As Joe Jervis points out, it’s a freaking Woody Guthrie song, written as a counterpoint to “God Bless America.” The song, itself, is about being INCLUSIVE, which runs completely counter to the National Organization for Marriage’s platform of hatred, bigotry and exclusion. Anyway, Peter Yarrow would like them to stop, please. It’s funny; that song came up on my iTunes just last night. Joe posted it, so I’ll go ahead and re-post it. And then the next post will be our weekly recap and Late Friday Random Ten music post.